Surprise Parties develops a Bachelorette Party format consciously modeled to appeal to any woman associated with a wedding in the "Summer of 2009"
Virtually anyone can host a bachelorette party. Often the maid of honor and bridesmaids, who are close to the bride, do the honors, but any friend, or even coworkers who feel the urge can plan this party. All you have to do is call, and we do the rest! Although the practice of giving a party to honor the bride-to-be goes back for centuries, in its modern form, the bachelorette party may have begun during the sexual revolution of the 1960s. Compared to the bridal shower, which helps the bride-to-be acquire possessions or a dowry and reinforces traditional gender roles, a bachelorette party is an expression of social and sexual freedom. Surprise Parties Bachelorette Parties assure any woman of a turnkey solution for one of the biggest pre-wedding events a bride and her friends can hold. "In America, the Bachelorette Party is all about female bonding," said Surprise Parties' Donna Wittrig. "We not only understand that, but we understand the significance of what comes after the Bachelorette Party…a lifetime of intimacy for bride and groom. Our goal is to not only have a party where the girls have a great time and are entertained, but that the bride is presented with knowledge that, quite frankly, isn't served up any place other than a Surprise Parties Bachelorette Party." Dee Tracy of Wauconda, Illinois is living proof of the concept. "I just had my 3rd Surprise Party and it was a BLAST! My first Surprise Party was at my Bachelorette Party, whew what a good time; almost as good as the honey moon itself. Since then I schedule a party about once a year and find that it's a great reason to get the girls together for a fun evening. Everyone always has a great time! Surprise Parties is fantastic at presenting the products in a professional, mature way that doesn't make anyone uncomfortable and there are always lots of laughs!" When held in a private venue, such as the hostess's home, the party may take any form that pleases the hostesses and honors the bride-to-be. Dinners and cocktail parties, which provide comfortable opportunities for participants to talk or to give intimate advice to the bride-to-be, is the order of the evening. Intimate advice is only as valuable as the experience behind it, and Surprise Parties takes great pride in making sure that the 'information' is not only made available, but presented in a comfortable, fun, and party atmosphere. "I was shocked when I first arrived at my Bachelorette Party that my Maid of Honor hosted for me. Then it dawned on me, he thought he was going to rock my world on our wedding night and I decided with the fun love stuff from Surprise Parties I would make his eyes roll back in his head with excitement. Enough said - we've been married for 3 years and it's still a party in our bedroom - no boredom here." A Surprise Parties Bachelorette Party is typically hosted by one or more members of the wedding party, although it is possible for any friend to host a party in honor of the bride-to-be. The bride-to-be often participates in the planning of her Surprise Parties Bachelorette Party. "While it is normally the duty of a hostess to pay for the entertainment she gives her guests, that's where Surprise Parties truly shines...the event itself is FREE, and the hostess actually earns money and shares in the savings on products and novelties the anybody in the party can take home with them to spark a little 'honeymoon' interest at home!" said Wittrig. Because of the time of year, Surprise Parties gears up its Lebanon, Tennessee headquarters to meet demand. Interested individuals simply need to call 1-877-787-7749 or visit the company's website at http://www.SurpriseParties.com. Surprise Parties are tasteful, chic, educational, and bodaciously entertaining! And, because the event itself costs nothing to host, there's no reason not to book your party for you, your friends, and that bride-to-be in your life. 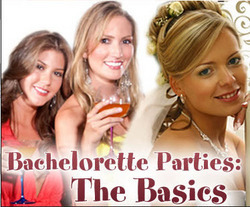 Added Wittrig, "Virtually anyone can host a bachelorette party. Often the maid of honor and bridesmaids, who are close to the bride, do the honors, but any friend, or even coworkers who feel the urge can plan this party. All you have to do is call, and we do the rest!"